New Job listings posted to website! Please remember that we list available jobs every week. But we are constantly working on filling them, and sometimes great jobs we have available, do not make the web page. This is because we fill them so fast. We have outstanding clients looking to hire NOW! BIRK Staffing also has fantastic candidates that we are currently working with so they get first dibs at the opportunities. So please do not think because a job is not listed on our website that it does not exist, that’s foolish. We have so many listings that we can’t list them all. The locations are from Waukegan, to Downtown, to Schaumburg and Elk Grove Village. We handle the Chicagoland area as well as the Northern Suburbs. If you have questions please feel free to call us. Other wise you can email us at [email protected] and upload your resumes. Apparently Pink had a very strong response to Grammy President Neil Portnows comment about female artist. 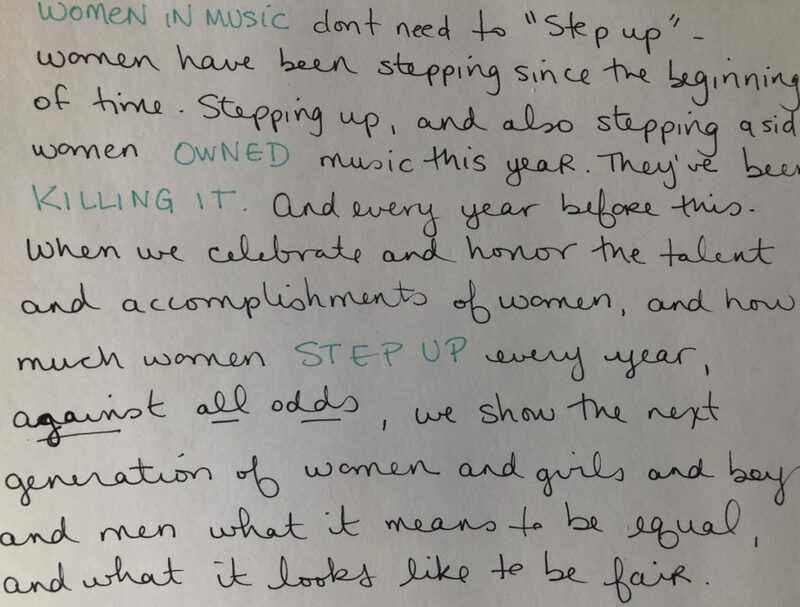 The comment “Need to step up” is what was really offensive to female artists. Above is a response “Pink” had made to him. 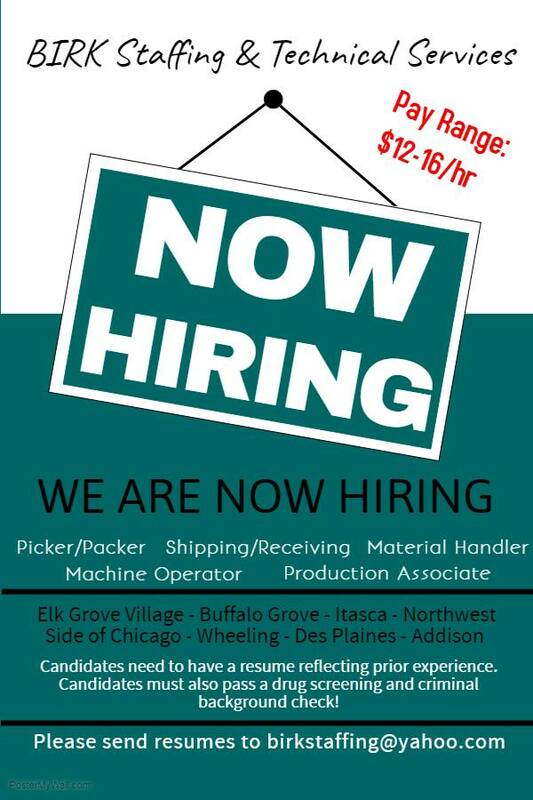 BIRK Staffing in Park Ridge currently hiring! 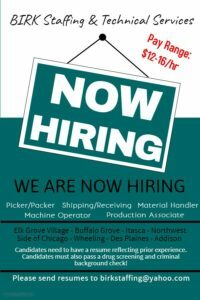 We are hiring for several large corporations in the northwest suburbs, including Elk Grove Village, Itasca, and Glendale Heights, IL Not only are we hiring for manufacturing and warehouse, but offices positions too! We have several high level direct hire jobs as well. Please view our “Job Opportunities” page on our website but call the office for more information. BIRK Staffing in Park Ridge, has posted some of our new direct hire opportunities! Please take a look and see if you might have an interest or even know someone who needs a job or wants to change jobs. For 20 years we have been happily serving our clients and candidates in the Northwest Suburbs, and Chicagoland! BIRK Staffing is looking forward to a happy, safe, and prosperous 2018! BIRK Staffing’s W-2’s will be mailed by the last week of January. PLEASE, PLEASE make sure to contact us if your address has changed since you applied with us! If you do not provide us with your accurate updated address – even if you are not currently working for us – the W-2 will be delayed in getting to you. We do not have copies of them in the office. If we have to request another copy, it will have to go through our accounting office and not sure how long that will take. So again, please make sure that we have your updated address.